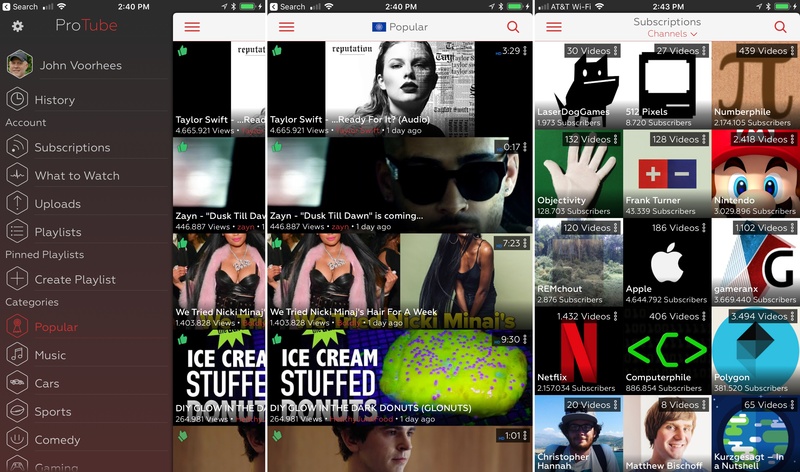 ProTube, a YouTube power-user app that I reviewed last year, has long had features that the official YouTube doesn’t have or was slow to implement. Features like background audio playback, support for 4K video at 60fps, Split View support, Picture in Picture, and a URL scheme for automation, put Google’s YouTube app to shame. However, as the YouTube app began to implement some of ProTube’s unique features as part of its $10/month YouTube Red service, I wondered what might become of ProTube. Unfortunately, it looks like the answer came late last week when Apple pulled ProTube from the App Store. The app, which was pulled from the App Store on September 1st is no longer available for sale and will no longer receive updates, but remains available to re-download if you previously purchased it. It’s a shame to see ProTube go. It implemented features Google didn’t care, or want, to add but that a subset of YouTube users wanted as demonstrated by the top charts numbers in Gessner’s post. However, ProTube also implemented features that YouTube wanted to reserve for paid subscribers and the result, while disappointing, is one of the risks of building an app on top of someone else’s service.